Scooper - Technology News: We’re heading for a water crisis. Could Denmark save the day? We’re heading for a water crisis. Could Denmark save the day? The beautiful Seine River has been cooling buildings in Paris for more than 20 years. Architectural highlights like the Louvre Museum and the Banque de France rely on a 52 kilometre network of pipes that provides the perfect indoor temperature for Mona Lisa and Co. The Paris underground network is one of the largest district cooling systems in the world. It helps the city mitigate extreme urban heat while saving 500,000 cubic metres of drinking water. Highly efficient. This is just one of many examples of how cities are getting better at producing and utilizing renewable energy. Smart energy systems can now integrate renewable energy cost-efficiently. However, water and wastewater management still account for 8% of global energy consumption according to the UN. This naturally leaves room for improvement. One energy-producing wastewater plant in the Danish municipality of Aarhus has already seized this opportunity – it now produces 90% more energy than it uses. Every waste water treatment plant can do the same. 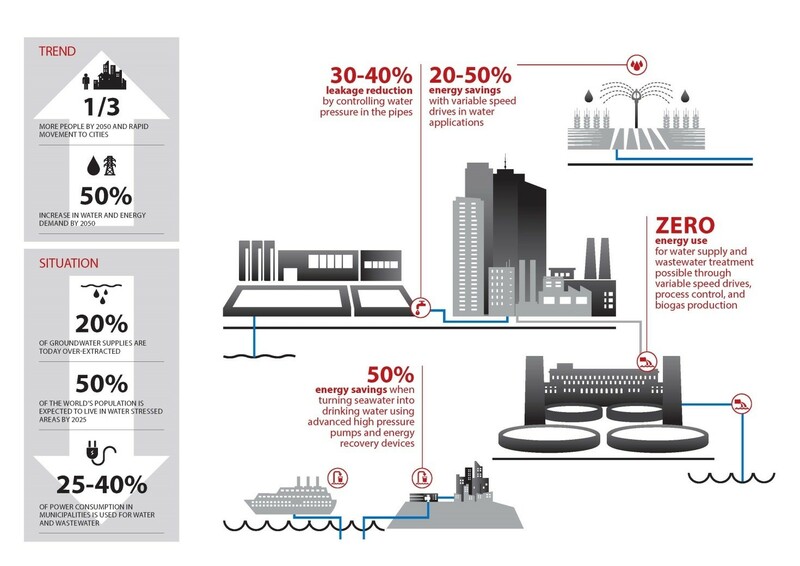 A typical European municipality still uses between 30-40% of its total electricity consumption on water treatment. This is a high cost to any municipality, and is money that could instead be spent on things like education or infrastructure. 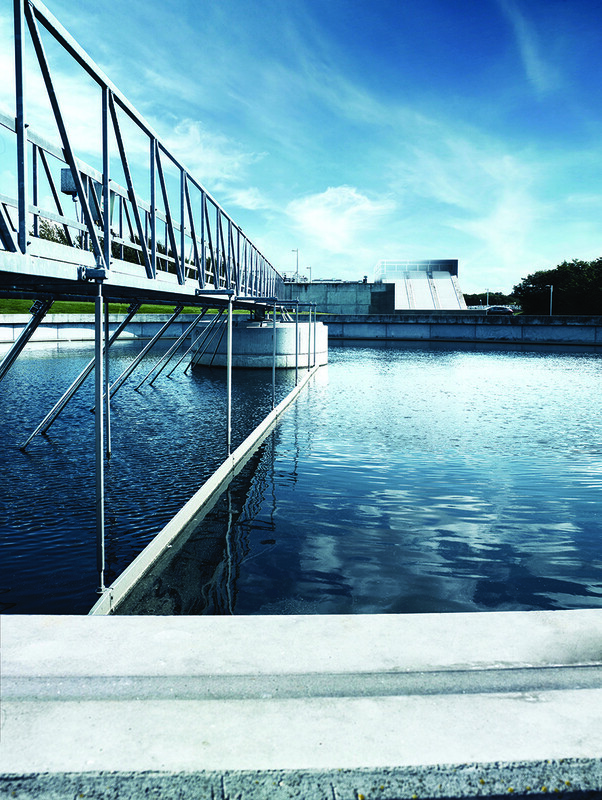 Aarhus proves it is possible not just to reduce that amount significantly, but to actually turn the water management plant into a surplus enterprise. In this year’s Global Risk Report , water crises were evaluated as one of the highest risks to the world, and that with the biggest impact. It is thus clear that we need to act in order to secure sustainable, reliable water in the future. The decisions we make today will greatly influence our well-being both as individuals and as a society in the future. Let us take the opportunity to look a few years ahead – to the year 2030. By then, the population will have grown to 8.5 billion people, according to the UN , of which 5 billion are expected to have chosen to live in either towns or cities. This development will create a demand for solutions that can ensure liveable cities and high quality of life, and prevent urban heat islands – urban areas that are significantly warmer than surrounding rural areas due to a high level of human activities. By 2030, if we choose to continue business as usual, water demand will likely exceed what we have by at least 40% . By 2030, we should also have achieved the Sustainable Development Goals, including goal number 6 , which aims to: “achieve universal and equitable access to safe and affordable drinking water for all” and “substantially increase water-use efficiency across all sectors and ensure sustainable withdrawals and supply of freshwater to address water scarcity and substantially reduce the number of people suffering from water scarcity”. What can we do today to make sure we’ve achieved this by 2030? The answer is connectivity. Connectivity across sectors and across SDGs, enabled by energy efficiency. By connecting SDG 6 to SDG 7 – which covers access to affordable and clean energy – we can turn the link between energy and water into a smart energy system, which in fact is an essential part of the solution today. The circular economy – the ability to decouple growth from consumption – is rightfully attracting more and more attention. So far, we have been talking a lot about circularity in value chains and closing the loop by recirculating materials and products. Going forward, we must think across value chains. We need to create links across sectors and apply the circular economy concept to connecting water, waste water, heating, cooling and electricity. There is a great potential to better utilize our resources by making water management more energy efficient, as proposed by the EU Commission in the Circular Economy package. Circular supply chains must be the goal. But what does this have to do with a waste water plant in Aarhus? The municipality managed to convert one of its biggest energy consumers into an energy net producer, converting more than 25% of its total energy consumption into a new source of energy. This was done through a strategy that connected across sectors and in the entire system from the beginning, to the distribution, to users. What it shows is that in some of our biggest challenges lie the biggest opportunities. The solutions to threats like water crises already exist. We just need to collaborate to unlock the great potential that lies in all the world’s cities.